Our NYC, Long Island and Queens Medical Spa offers customized IV Vitamin Drips to suit all your needs! . Different drips can effectively replenish a variety of deficient or low vitamins levels and minerals in the body as well replace lost fluids. We can custom make specific IV drip bags or infusions to replenish known vitamin deficiencies in the body or for specific purposes such as a cold or flu, migraine headaches, fatigue, viral infections, skin lightening, skin health, beauty, hair, anti-aging, hangovers. As mentioned our IV drips can be customized for energy, immunity, anti-aging, weight loss, detoxification, cleanse, anti-oxidant properties, sleep, inflammation and more. 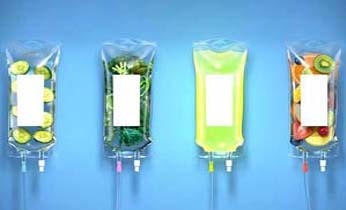 IV hydration is accompanied with all of our IV infusion therapies for fluid and electrolyte replacement. You can choose to receive a larger saline bag for hydration therapy or multiple saline bags as needed to treat dehydration or hangovers. Depending on the amount of fluids received, the size of your veins, and the nutrition therapy provided- IV Vitamin Therapy takes 20 minutes to 30 minutes for an infusion containing 500cc or less and longer for saline bags containing one liter and more. Our office does provide a combination of vitamins specifically tailored for specifics needs. Contact us today to schedule your vitamin drip today!